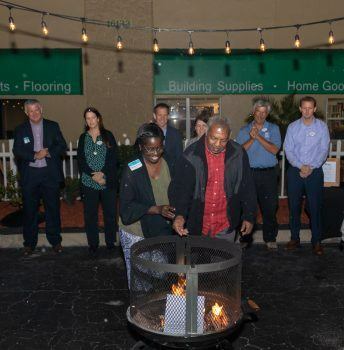 Habitat for Humanity of Lee and Hendry Counties has announced its slate of officers and two new members of its Board of Directors for 2019. Joining the Board of Directors are Ginny Dickinson and Debra Penuel. Returning board members are Patricia Benner; Tim Byal; Edward P. Canterbury; Vicki Cooper; Jeananne Folaros; Cheryl Glover; Erica K. Harp, CPA; Tim Hawkins; John Hill; Mitch Hutchcraft; Paul Martin; Steve McIntosh; Linda Miller; Mike Mullinix; David Owen; and John Tobler. Visit habitat4humanity.org. for more information about Habitat for Humanity. Above: Gary Aubuchon speaks with attendees during the Habitat for Humanity mortgage burning ceremony. 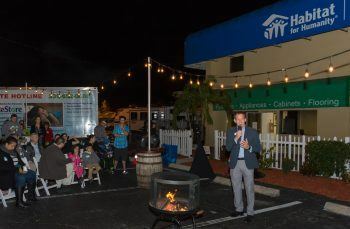 The event is a celebration for Habitat homeowners who have paid off their mortgage.